Google is not the most popular search engine for no reason, its method of searching the web and drawing the most relevant results is still to this day somewhat unparalleled. So when shopping online or trying to sell an item online, why not use Google as a tool. If you already have an existing Google account, then using product search is already a couple of clicks away. And if you do not yet have a Google account, you can get one by filling out a quick form. Many people choose to shop online due to its convenience and the much lower prices compared to what would be offered locally. Also, shopping online is a great way to get an item that may not be readily available in your area. Chances are that you already use Google, and you have already used product search, whether or not you realized it at the time. When you search Google for a particular item or product, many times you will see the words "Shopping results for…" appear near the top of Google search listings. This is Google product search. You can also access product search directly here. When you do a search within Google product search, you are getting access to product prices from all over the web. Like a basic Google search, product search by default lists the most relevant results first. However, you can sort by price, product rating, and seller rating as well. This is a very efficient way to find the product that you are looking for, as it uses Google’s patented search engine technology while filtering for products only. The best advantage this tool has for buyers is its effectiveness + its simplicity. All you have to do is perform a Google product search, it then shows you basically everything that you need to know about a product right there from within the search results. If you are unsure about a product, you can also read seller and product reviews written by other consumers right there within search results. Most people will probably like product search the most for its ability to find the cheapest price on an item. Sellers can also take advantage of using Google product search. To do this, all you need to do is start a data feed which you can access here. 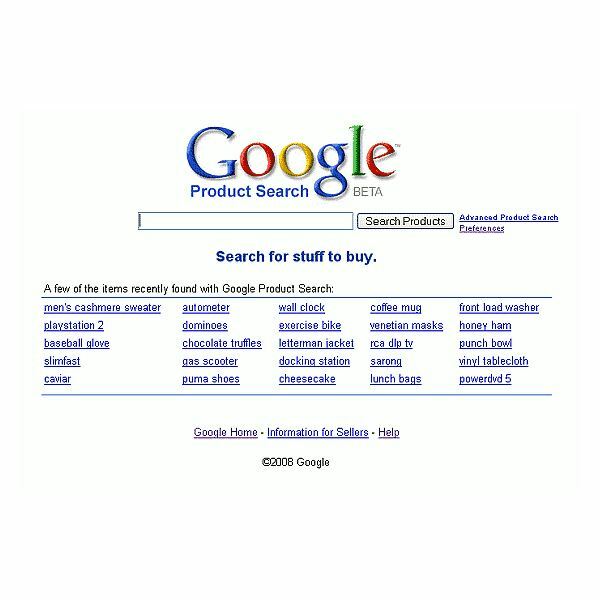 Sellers benefit from using Google in the fact that listing items in product search is free. No listing fees like you may find in sites such as Ebay. Also, you are reaching a potential greater number of buyers. Even if someone is not necessary looking for your specific product, they may run across it naturally just by doing a Google search. Using product search for sellers potentially puts your items in front of the largest crowd on the web, the Google web searchers. Better yet, if you do already have a Google account, customers can pay for your items by simply using Google checkout, offering an all-in-one solution.